Thanks in part to the baby boom, the employment-population ratio understates the amount that the economy has recovered. Before the recession began, 63 of every 100 people age 16 and over were employed. The percentage plummeted to 58.4 by the fourth quarter of 2009 and hasn’t moved far from there since. A variety of economists have used the ratio and its dynamics to indicate that the economy has hardly recovered. Some say the employment-population ratio’s lack of recovery is because of insufficient government spending; others suggest that it might reflect policy failures of the Obama administration. But the employment-population ratio is influenced by important factors beyond the control of the president. One of them is the aging of the baby boomers. The employment-population ratio was expected to fall as baby boomers reached retirement ages between 2008 and 2015, even without a recession. For this reason alone, a full recovery would mean an employment-population percentage of about 61. Although much attention last week was given to the August-to-September increase in part-time employment, the average hours worked among private-sector employees have increased sharply since 2009 and are now about the same as they were before the recession began. 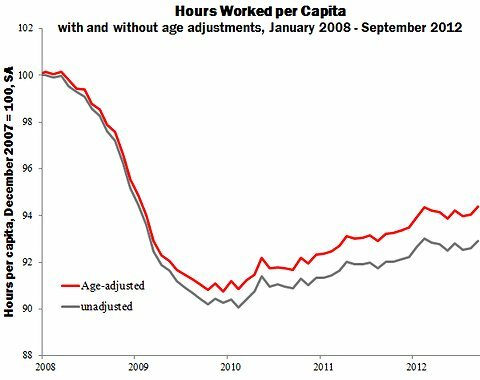 The chart below shows a recovery when the quantity of labor is measured in terms of hours worked per capita (gray) or age-adjusted hours worked per capita (red). Both indexes are set to 100 in December 2007; the age adjustment is taken from my book on the labor market since 2007. The red series hits bottom at 90.8 and now stands at 94.4. Unlike the employment-population ratio’s negligible recovery, the age-adjusted hours series has recovered about 40 percent — four points — in three years. To be sure, an additional six points of the recovery still remain, and the labor market continues to be depressed by public policies enacted over the last four to eight years. But some of these policies, such as mortgage assistance, the three increases in the federal minimum wage and the federal rules giving states more flexibility to expand food-stamp participation were begun before President Obama took office and probably would not have been overturned if John McCain had won the 2008 election. Some of those policies had broad political support. Thanks to demographic and political changes, a full labor market recovery may be beyond any president’s reach.